The Registrar’s Office must receive approved course proposals in time to enter those courses into MyMadison for each semester’s registration. Changes can only be entered into MyMadison after they have completed the C&I process. Because we know that your academic units need access to the courses for scheduling, here are the dates that the Registrar’s Office uses in preparation for registration. March 18, 2019, Monday Advance registration for 2019 summer session begins. April 1, 2019, Monday Registration begins for 2019 fall semester. November 4, 2019 Monday Registration begins for 2020 spring semester. For a proposal to be completed by February 1, it should be approved by your college dean by Friday, January 4, 2019. The suggested date to enter a proposal effective Fall 2019 is November 15, 2018. 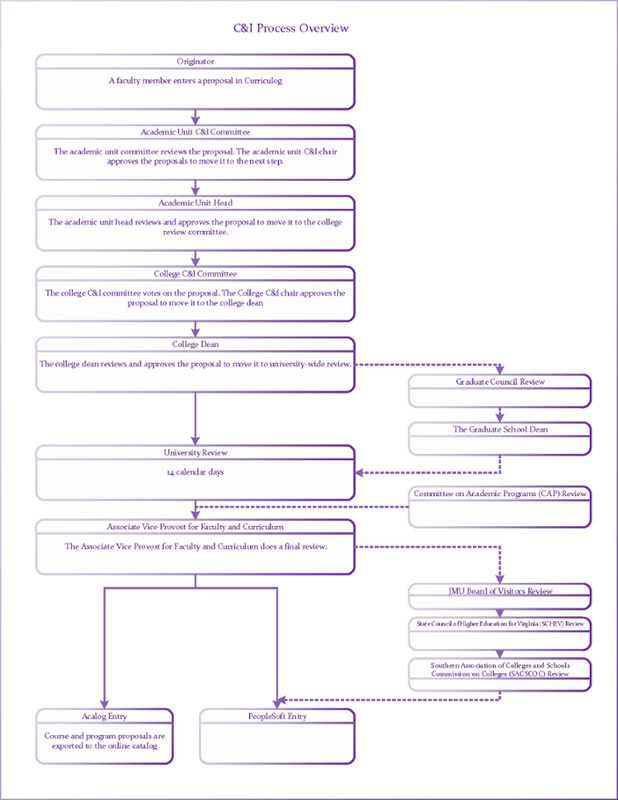 The university C&I process is outlined in the JMU Faculty Handbook, and each college maintains specific procedures for their college. For more information on your college's C&I process, contact your College C&I Chair. All curricular proposals originate from faculty members at the academic unit level and follow the same general review process. Depending on the type of proposal, additional levels of review may be needed. For example, a new course proposal is reviewed by the offering academic unit, the college in which that unit is housed, and by the university community. A new program proposal, such as a new major, would begin with a proposal preview. After this review is approved by the Office of the Provost, the proposal would complete the same steps in addition to review by the Committee on Academic Programs, the JMU Board of Visitors, the State Council of Higher Education for Virginia (SCHEV) and the Southern Association of Colleges and Schools Commission on Colleges (SACSCOC). A general overview of the process is show below. For more detail, see Course and Program Proposals from the links on the left.